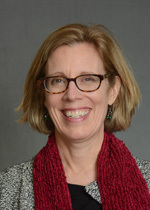 Karen E. Brown, MD joined Whitney Internal Medicine in July 2005, bringing eleven years’ experience caring for patients at YNHH Adult Primary Care Center, where she was named director in 2002. She graduated from the University of Maryland School of Medicine and completed her residency at Yale New Haven Hospital. Dr. Brown lives in Cheshire with her husband Phil Brewer. Together they have four children, two of whom still live at home. Karen is an active parent volunteer and community volunteer in addition to her time spent practicing medicine. Dr. Brown is not accepting new patients at this time.